Just before CES officially opened this week, Faraday Future showed off its first concept to the world. It was arguably the most hyped launch in the history of electric vehicles, with teasers surfacing at a regular frequency leading up to the big reveal. At the event, Faraday Future reiterated over and over that “we move fast” and seemed proud of the concept that will likely move to production. 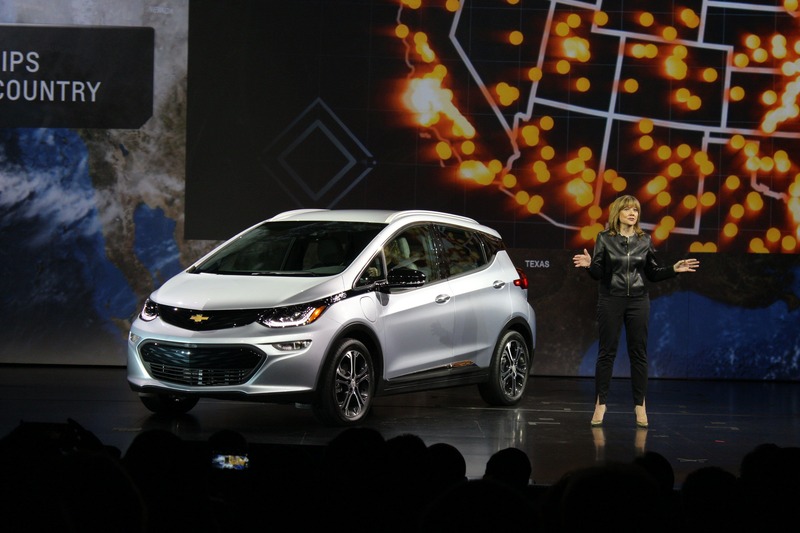 Two days later and Chevrolet is in the CES spotlight with the biggest EV event of CES 2016 — the official reveal of the production version of the Chevrolet Bolt (which we live blogged). In stark contrast with FF, GM took an extremely low-profile approach to get the word out about the Bolt with only a few public appearances, next to no advertising… just putting in the blood, sweat and tears (I’m sure there were a few) and getting the car built as fast as possible. And with good reason — at the time, the Tesla Model 3 was expected to be the first affordable 200-mile-range electric car and GM was nowhere close to having a competitor. Fast forward to today and Chevy seems to have pulled a rabbit out of a magic hat, revealing the production version of the Bolt AND announcing that it will be available before the end of 2016, which is extremely impressive and shows just how aggressive Chevy has been developing the breakthrough car and putting plans in place to get it to market. Chevrolet’s continued progress in bringing forward-looking electric cars to market shows just how much it believes in EVs as the future of personal transportation. Riding on the tails of the success of the original Volt, the Bolt continues the electric transformation in what seems an earnest effort to embrace EVs (finally!). Having lost the trust of many early adopters after crushing its early EV1 program in the 1990s — literally — many are still skeptical but are gradually warming to the idea that GM is serious about EVs. Official production volumes for the Bolt are still a question, as limited availability could quickly mute the excitement and stifle sales — we have heard estimates of 30,000/year, initially. Spy shots spilled the beans on the final look of the Bolt but the nuts and guts stayed the same as the concept, which are really the exciting bits of the car — especially the range at 200 miles and the price at $30,000 after rebates. GM was keen to highlight these points with bold banners proclaiming the good news many times throughout the presentation. The Bolt isn’t just a stripped down Aveo with an electric drivetrain — this thing carries the innovation from the Volt forward and even raises the bar. The Bolt includes a wide-angle rearview camera that gets pumped through the multimedia display when the vehicle goes into reverse, which is fairly typical these days but kicks it up a notch by giving drivers the option to pull the feed into the rearview mirror, overriding the normal reflective surface with the video feed. Spicing it up further, the Bolt comes with LTE connectivity and is the first EV to feature compatibility with both Android Auto and Apple CarPlay, which should satisfy users from both tech clans. “The Bolt EV is capable of using the latest mobile app technology to enable car sharing, advanced GPS routing and gamification, all designed to enhance the ownership experience now and into the future,” said GM Chairman and CEO Mary Barra. The car will make use of the LTE connectivity to offer EV-specific navigation, which will integrate compatible charging stops as needed, a la Tesla with the automatic inclusion of Supercharging stops along a route. 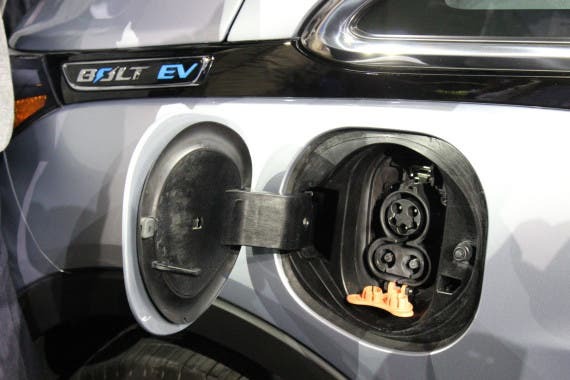 For charging, the Bolt carries along standard charging rates, proclaiming that it will regain 80% of a charge in just 60 minutes — or roughly the same DC fast charging rate comparable EVs get today. The Bolt packs the Chevy standard SAE Combo charging port, so drivers can tap into any J1772 charger to top up or step it up to a DC fast charger using the full SAE Combo plug. It is worth noting that a 60-minute fast-charging session is double the current fast-charging session time… which makes sense for a battery that is twice the size (with more than double the range). As far as the charging speed goes, the official Bolt website claims a typical J1772 (Level 2 AC) charger will add 25 miles of range per hour. Using the miles per kWh efficiency of the Leaf (4.1 mi / kWh), that would be a rate of 6 kWh which is just under the typical 6.6kW charging rate. As manufacturers typically state “best case,” this supports the Bolt having a standard onboard 6.6kW charger. The batteries for the Bolt are in a skateboard layout, meaning that they are arranged in a flat layer at the very bottom of the car. This keeps the weight distribution even, keeps the center of gravity low, and, importantly, keeps the batteries from protruding into the cabin — whether under the seats, in an unnecessary tunnel down the middle, or otherwise. It is not clear what type of battery cells or what layout they are in, but Chevy used pouch cells with the Volt, so that is a likely candidate. Finally, GM will be introducing gamification at a later date to encourage owners to track and compete to be the most conservative with their energy usage. 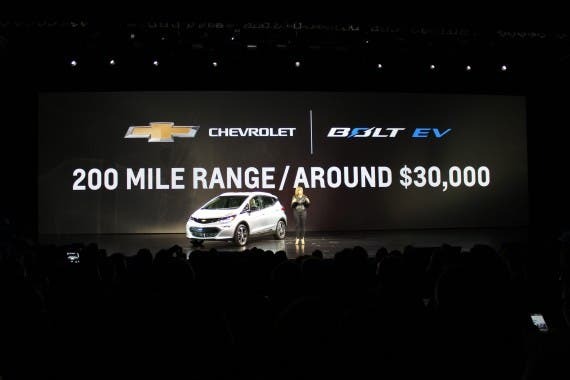 This has been a somewhat unexpected trend with the Volt and it appears that GM wants to get Bolt owners engaged in some good old-fashioned competitive conservation as well. 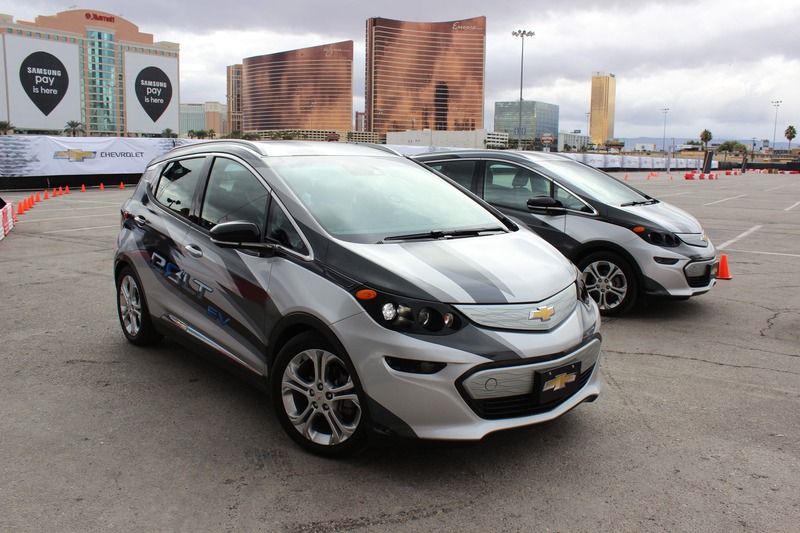 After the main show, Chevrolet brought two Bolt mules out to a nearby track for some road time. These were ~80% complete, vs the Bolt shown off on stage, which was a fully built production version. The throttle of the Bolt was snappy and easily made the tires chirp as it zipped around the track. Below is a video showing the Bolt zipping around the short track assembled in the CES North Plaza.